This series is organized by Get Fast Events and the National Auto Sport Association’s Mid-Atlantic Autocross Region. 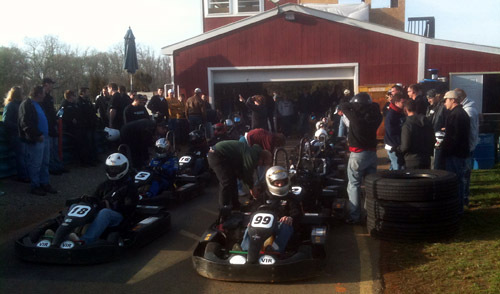 It has evolved from the dozens of “just for fun” twilight kart enduros we have put on since 2007 with hundreds of fellow racers and friends during many road course event weekends. These arrive-and-drive events at well known outdoor facilities are open to just about any adult or teenage driver. 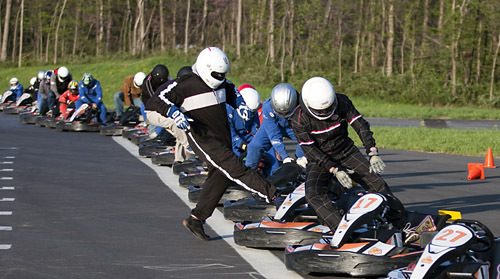 The karts will be provided, and identically prepared. Each championship race will be 120 minutes long, into the darkness/under the lights, rain or shine (within reason), for at least two drivers per team. There is no race qualifying – starting positions will be randomly assigned and some races will feature a Le Mans start. A minimum number of pit stops will be required, to make the racing more fair for our many 3- and 4-driver teams. Online pre-registration is available from here. Teams shall declare a captain and a team name at their first event and championship points will be posted online after each round. Trophies will be awarded to our winners. NASA membership is not required and experience is not necessary. Loaner helmets and racing suits will be available at no charge. All drivers must sign the waiver and be 18 years of age (although those under 18 may be allowed to participate with a parent or legal guardian present, please inquire.) Friends and family are welcome. Spectating is free and encouraged. Please come race with us anytime!